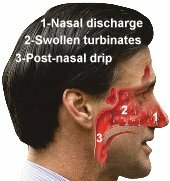 Doctor, what is Post-Nasal Drip? Swallowing problems may result in accumulation of solids or liquids in the throat that may complicate or feel like post-nasal drip. When the nerve and muscle interaction in the mouth, throat, and food passage (esophagus) aren't working properly, overflow secretions can spill into the voice box (larynx) and breathing passages (trachea and bronchi) causing hoarseness, throat clearing, or cough. With age, swallowing muscles often lose strength and coordination. Thus, even normal secretions may not pass smoothly into the stomach. Swallowing problems may be caused also by gastroesophageal reflux disease (GERD). This is a return of stomach contents and acid into the esophagus or throat. Heartburn, indigestion, and sore throat are common symptoms. GERD may be aggravated by lying down especially following eating. Hiatal hernia, a pouch-like tissue mass where the esophagus meets the stomach, often contributes to the reflux. Allergy is managed by avoiding the cause if possible. Antihistamines and decongestants, cromolyn and steroid (cortisone type) nasal sprays, and other forms of steroids may offer relief. Immunotherapy (allergy shots) also may be helpful. However, some older, sedating antihistamines may dry and thicken post-nasal secretions even more; newer nonsedating antihistamines, available by prescription only, do not have this effect. Decongestants can aggravate high blood pressure, heart, and thyroid disease. Steroid sprays generally may be used safely under medical supervision. Oral and injectable steroids rarely produce serious complications in short-term use. Because significant side-effects can occur, steroids must be monitored carefully when used for more than one week. Gastroesophageal reflux is treated by elevating the head of the bed six to eight inches, avoiding foods and beverages for two to three hours before bedtime, and eliminating alcohol and caffeine from the daily diet. Antacids (e.g., Maalox®, Mylanta®, Gaviscon ®) and drugs that block stomach acid production (e.g., Zantac®, Tagamet®, Pepcid®) or more powerful medications may be prescribed. A trial treatment may be suggested before x-rays and other diagnostic studies are performed. Many people, especially older persons, need more fluids to thin secretions. Drinking more water, eliminating caffeine, and avoiding diuretics (fluid pills) will help. Mucus thinning agents such as guaifenesin (Humibid®, Robitussin®) may also thin secretions.